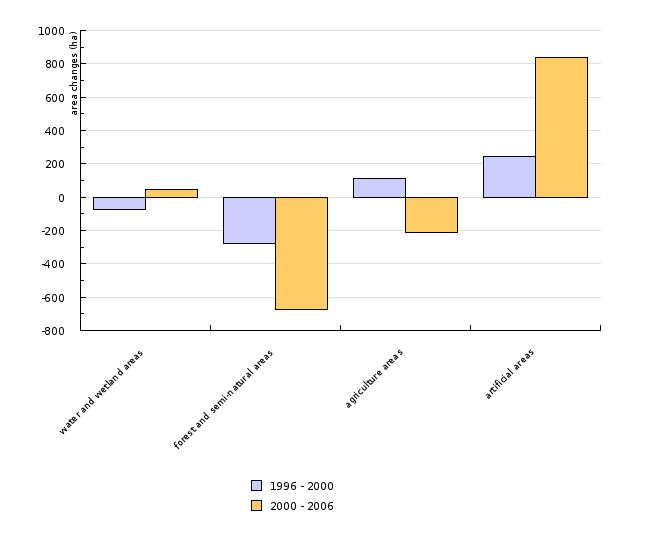 The indicator shows the characteristics of land use and land cover, as well as their change between 1995 and 2000, applying CORINE Land Cover methodology. 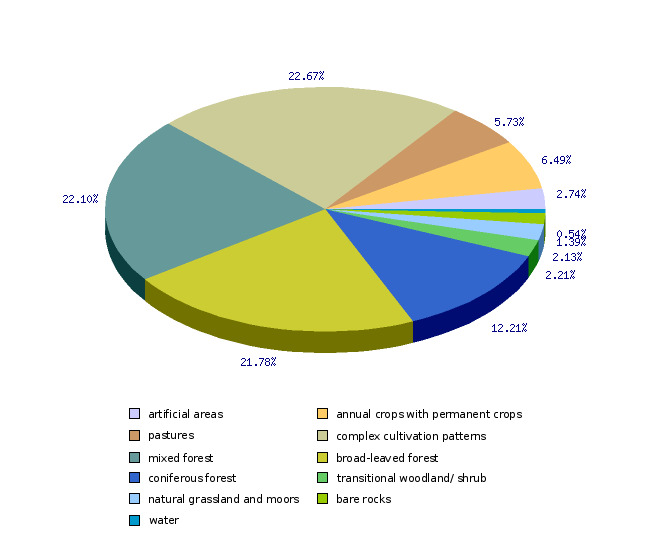 Land use relates to the exploitation of land caused by human activity in the landscape, and is one of the best indicators of landscape structure and processes. Basic categorisation distinguishes simply between rural and urban land uses. Land cover demonstrates the physical aspect of land surface, irrespective of its purpose. It comprises the following categories: artificial areas, agricultural areas, forest and semi-natural areas, wetlands and water bodies. The indicator offers answers to the questions as in what way and to what extent the landscape is changing, as well as where the most intensive processes are taking place. Brought to the fore are the relationships among various types of use (urban, agricultural, etc.) that are driven by social and economic activities. The nature of settlement distribution indicates whether the scope of impact is broad (covers the entire region) or narrow (limited to a specific area). The National Environmental Action Programme envisages the preservation of unspoilt large forest ecosystems and ensuring a harmonised use of forest areas among forestry, agriculture, military and transport sectors, as well as water and electricity supply. Through moderately intensive, ecologically acceptable forms of agricultural production it provides not only for the preservation of fertile land, but also for the preservation of urban areas and diverse cultural landscape intended for leisure activities and tourism development. In the light of land cover and land use change, the period between 1995 and 2000 is a brief one and the changes demonstrated small, since the applied methodology covers only major changes (above 5 ha). 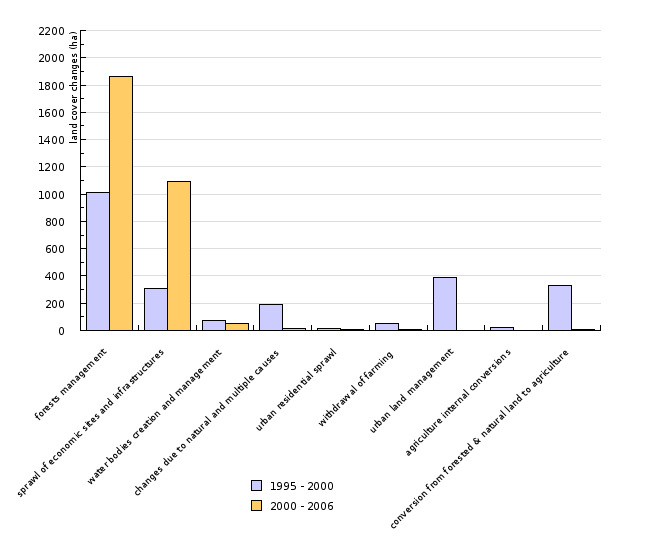 A detailed overview by individual categories indicates that during the period in question, the shares of discontinuous urban fabric as well as industrial, road and rail network units increased, while the share of mineral extraction sites, dump sites and construction sites decreased. The greatest expansion with regard to agricultural land occurred in pastures, while the extent of non-irrigated arable land, complex cultivation patterns and land principally occupied by agriculture, with significant areas of natural vegetation, decreased. In forests, only transitional woodland shrub experienced an increase, while the share of broad-leaved, coniferous and mixed forests decreased. During the period 1995-2000, the ratio between forest areas, on the one hand, and agricultural and artificial surfaces land, on the other, was maintained at 1:1.64 in favour of the former. The data on population density in Slovenia are taken from Kladnik, Ravbar, Rejec Brancelj: Expert Bases for Defining Typical Rural Areas in Slovenia, Institute of Geography, Ljubljana, 2001 – calculated on the basis of the data provided by the Statistical Office of the Republic of Slovenia for 2000. Within the framework of the Environmental Agency of the Republic of Slovenia, Ministry of the Environment, Spatial Planning and Energy and Surveying and Mapping Authority of the Republic of Slovenia, the following databases were created: CORINE Land Cover 1995 (created in 1998) and CORINE Land Cover 2000 (created in 2003). The data are publicly available at http://cdr.eionet.eu.int/si/eea/te1/envp_lbzg . The databases were created through remote sensing of satellite images. Since Slovenia joined the project in 1996, the data, in this case, has been collected over a 5-year period; otherwise the updating process takes place every 10 years. The data are divided into 44 classes merged into 3 levels. The minimum mapping unit is 25 ha and the minimum width of linear objects is 100 m. Account was taken only of changes at a minimum size of 5 ha. The data for 1995 were obtained from a photointerpretation of satellite images captured by Landsat 5 TM in 1995-1996, their digital processing and the production of digital vector database, called Land Cover Base 1995-CLC95 (CORINE Land Cover). The data for 2000 were obtained from a photointerpretation of satellite images captured by Landsat 7 ETM in 1999-2000, their digital processing and the production of digital vector database, called CORINE Land Cover 2000 - CLC2000.